We would like to personally welcome you to the Raleigh Orthopaedic Surgery Center. It is our privilege to provide care to you and your loved ones. Raleigh Orthopaedic Surgery Center is a wise choice for getting your orthopedic surgery done, as so many of our patients already know. Here, at the Raleigh Orthopaedic Surgery Center, we have assembled a team that is not only experienced, but also hugely hughley motivated and engaged in continued education and trainingcontinuously taking on trainings in orthopedics. Every patient receives personal attention and care. Our professional staff are dedicated to making a difference in your experience with us. We also offer patients and their families the convenience of having easy access to an outstanding group of physicians and staff at one location. We There, we will work with you individually, walking you through each step of the surgery process and answering all of your questions. The Raleigh Orthopaedic Surgery Center is committed to providing you with world-class services during your treatment. Your care will at all times be physician-directed and patient-focused. You are not only a patient to us; you are an individual, with your own exceptional circumstances, requirements, and needs. Our doctors, physical therapists, and other staff are devoted to bringing this standpoint to patient care, and work every day to fulfill our promise of bringing you back to the lifestyle and activities that you love. We use the most up-to-date surgical equipment to provide our patients high-quality, personalized care from start to finish in a cost-effective manner. The Raleigh Orthopaedic Surgery Center is the largest, most modern outpatient orthopedic facility in Eastern North Carolina. Our experienced team of highly skilled orthopedic surgeons, anesthesiologists, and other professional staff work together to achieve the best possible outcome for you. The Raleigh Orthopaedic Surgery Center has board-certified surgeons physicians with advanced training in their respective sub-specialties. 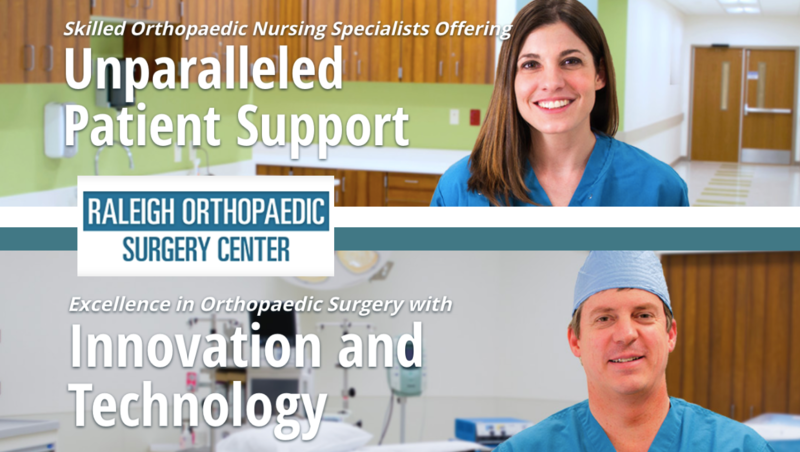 Raleigh Orthopaedic Surgery Center is the FIRST AND ONLY outpatient surgery center in the Triangle to specialize exclusively in orthopedic surgery. Raleigh Orthopaedic Clinic surgeons perform more than 4,000 outpatient orthopedic procedures on an annual basis. Here, at Raleigh Orthopaedic Surgery Center, we understand that surgery can be a stressful event in your life. Therefore, we want to give you all the information necessary, so you know exactly what will be happening, when, why and how. Our staff will take their time to explain everything you will need (or wish) to know and make sure you are comfortable with all the choices. To meet our patients’ specific needs, we propose a number of scheduling possibilities. Typically, all procedures scheduled at the Raleigh Orthopaedic Surgery Center should not be delayed by an emergency case. Hospital infections are understandably a great concern for surgical patients and their doctors. It’s our goal to help our patients and make them better. For this reason, we see surgical patients only. We always confirm if our patient is ill prior to the procedure, and if so, we reschedule the procedure for a later date. We also welcome your family and friends, and we would like this to be a pleasant and stress-free time for them, too. Whether it’s a reassuring smile, a fresh cup of coffee, a warm blanket, personalized education about your orthopedic procedure, or simply a hand to hold, we appreciate the opportunity to be your Orthopedic Destination. Read more about the visitors’ experience here. Our modern recovery area is created in a way to make your stay with us stress-free, comfortable, pleasant and relaxing. If there is anything that we can do to make your stay with us even more enjoyable or comfortable, our Raleigh Orthopaedic Surgery Center staff members will be more than happy to assist you. Surgery is a part of a course of treatment. You will be taken care of before, during and after the surgery. Even after you leave, we will be at your disposal for whatever health-related needs you might have. You can stay in touch with your physician, as well, by using our post-op hotline. Raleigh Orthopaedic Surgery Center is committed to community service. We provide charity care, in accordance with the patient’s need and the center’s ability. We do this by determining the ability to accept Project Access in lieu of payment on a case-by-case basis. The Raleigh Orthopaedic Surgery Center is accredited by the Accreditation Association for Ambulatory Health Care (AAAHC). The AAAHC certificate of accreditation is a sign that a healthcare organization meets or exceeds nationally-recognized Standards.